of fellowship with others as a result of sharing common attitudes, interests, and goals”. These two ingredients form the basis of Love, Peace, and Hip Hop, and that is why this festival has become such a success. 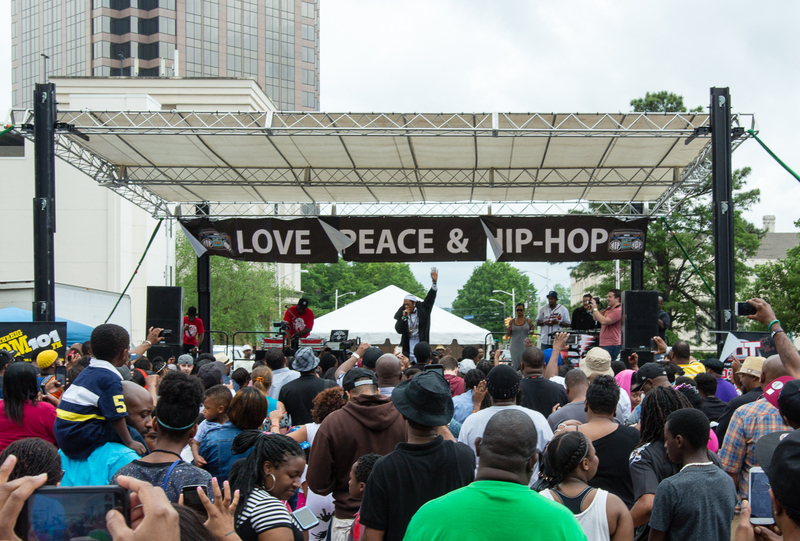 The third-annual Love, Peace, and Hip-Hop festival occurred on April 18, 2015 on Main Street from 11AM-5PM. In honor of the third year anniversary, Love, Peace, and Hip-Hop had three, hypnotizing headliners: Nice and Smooth (Bronx, N.Y.), Monie Love (London, England) and Big Gipp (Atlanta, G.A.). Each with a half-hour set, the headliners dominated the stage from 3:30 to 5. Preceding these headliners were ten outstanding, opening acts who covered the stage from 11 to 3:30. These acts were: New Success Culture (Columbia, S.C.), Big Redd (Columbia, S.C.), Nesha The Voice (Bennettsville, S.C.), Carolina Dirty (Eutawville, S.C.), Paris Rose (Atlanta, G.A. ), Dance South Company Dancers (Columbia, S.C.), BLVCK (Baltimore, M.D. ), Jigg Nevamind (Batesburg-Leesville, S.C.), J11 (Columbia, S.C.) and the winners of HOT 103.9’s “Rock the Block” contest: Qwintis Sential and Love Mo. I firmly believe that Love, Peace, and Hip Hop is an ideal exemplification of these words. This festival is a well-needed source of community-gathering for Columbia. It is an idyllic model of notions that are needed to be put into application; so that a legacy of Columbia’s Hip Hop industry may be formed. I commend all corporations that have invested their time, faith, efforts,in the hip-hop movement of South Carolina. Supporters and sponsors for Love, Peace, and Hip Hop 2015 include: HOT 103.9-93.9, DTLR, Well Care Health Plans, Healthy Connection, Columbia Music Festival Association, and Nickelodeon’s Indie Grits Film Fest.